Eating well is essential to feeling great. While most people can get away with the odd night out dining on rich or fatty food, making it a priority to regularly cook nutritious meals at home is the cornerstone of healthy living. But what to cook? I’m often asked to recommend recipes to back up dietary recommendations but finding an Australian cookbook that features delicious and nutritious dishes with locally available ingredients has been a tall order – until now. Tony Chiodo has been on the Melbourne food scene for many years. Classically trained in both French and Italian cuisines, Tony later took charge of his health swapping animal fats for tofu and studied Macrobiotics at the prestigious Kushi Institute. After stints at the wonderful Wild Rice Café in the ‘90s and his own Café Angelica he opened the Grainaissance wholefoods cooking school, which was a naturopath’s dream. While the school was in operation, I referred many clients to his classes and thoroughly enjoyed the one I did one myself. I’ve waited many years for this cookbook that brings together the skills and flavours of Tony’s European and Asian culinary background and I’m glad to have found it in his new book, Feel Good Food. For example there’s the lushness of a baked silken chocolate tart with a picture that looks so good I want to lick it off the page. The crust is made from spelt flour, ground almonds and coconut oil and the ‘silken’ filling is based on tofu, cocoa and rice syrup. Having made and tasted some of his recipes from his course and others published in Epicure in The Age, I know as unorthodox as the ingredients sound the tart will taste as good as it looks. As you’d expect from a macrobiotic influenced cookbook the savoury dishes use a variety of grains, beans and soy. There are also a handful of seafood and chicken dishes but overall the book is about 80% vegan (including the cakes and how to make tofu sour cream). I was happy to see some old favourites from his cooking classes included in the book, like the millet and cauliflower mash (that tastes more exciting than it sounds), variations on his pilafs and a fruit kanten (a jelly made with agar agar). His recipes are accessibly written but may include ingredients unfamiliar to a novice. However it includes clear instructions on how to use or cook them, such as recipes for steaming millet or quinoa. There are also some commonsense guidelines on how to cook and eat well, including seasonal eating and incorporating colour, texture and flavour. Like the recipes, the information is conveyed with a sense of fun and exploration without being preached at. Feel Good Food manages to deliver a very challenging brief, it presents food that looks and tastes so great that your guests or family won’t know they are being fed “health food”. 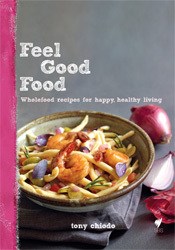 Feel Good Food is published in Australia by Hardie Grant and is available in local bookstores and online. A surprise for me to read in coverage of Chelsea Clinton wedding festivities that her wedding cake (450 guests) was gluten-free and the rest of the food was VEGAN. The caterers who pulled it off, have struck gold I’d think. Health column of last Weekend Australian reports on neurology research on 2148 people age 65, that those who ate red meat had more dementia than those who were the nuts and fish diet type. I really don’t want to be blind or stupid so I shovel blueberries into my buckwheat pancake mix, and grate raw carrot into my hot brown rice, and hope for the best. I must search the study on diet and dementia, sounds interesting. I wasn’t at the Clinton shindig so haven’t got the skinny on the menu but have read she’s allergic to wheat and doesn’t eat meat, though the cake is GF/vegan, rumour is the grass fed beef wasn’t.